My first images of the desert originated from watching David Attenborough documentaries as a child, seeing photos of the Sahara and Namib desert in my father’s books – and of course watching David Lean’s masterpiece Lawrence of Arabia. I am amazed to learn here in Namibia that the desert is all that but many other different things as well. All ethereally beautiful, haunting and magical. Namib desert. 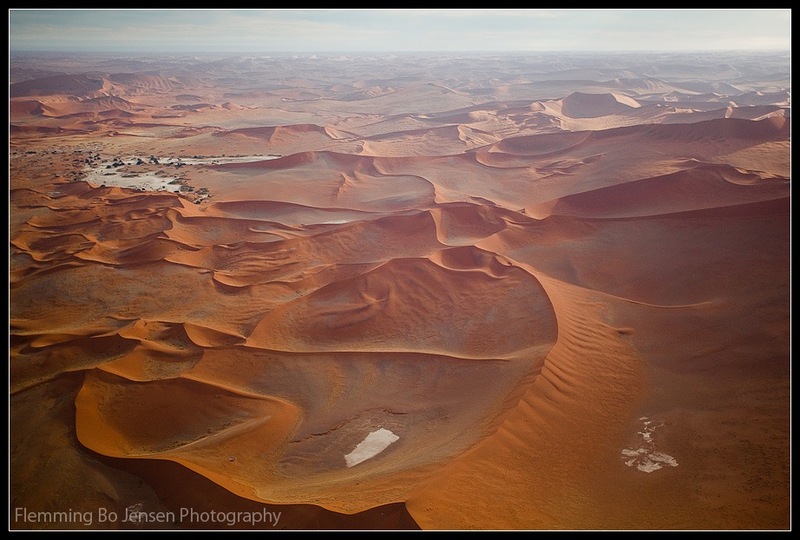 The name Namib actually means wide open space. You may think 8 hours of driving through the Namib desert would be 8 hours of repeat scenery. You would be wrong. The desert keeps changing and re-inventing itself, gravel desert, sand desert, majestic mountains (yes I too was surprised, huge mountains in the desert), rolling hills, wide open plains with wildlife, dried up riverbeds. Grass. It has rained more than normal so the desert is green in many places! And sand dunes of course. Massive sand dunes. Small dunes. yellow sand, orange sand, deep red sand. Rounded windswept dunes. Tall laser sharp dunes reaching for the sky. Desert. What is in a name? A lot more than I thought! 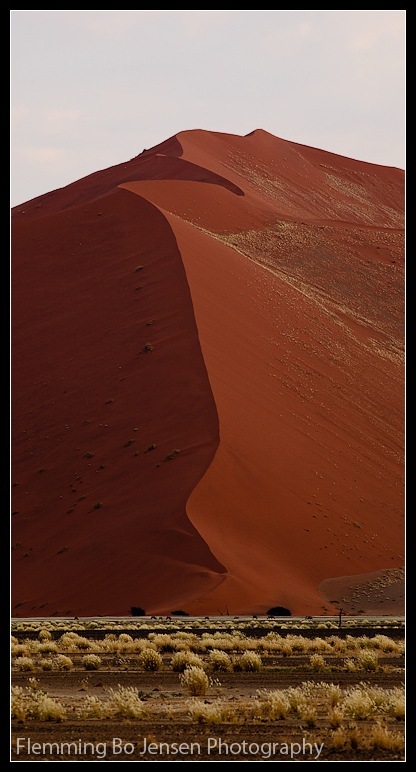 The Namib desert is over 2,000 km long. Two thousand kilometres. It boggles the mind and challenges all ideas of distances and space. So much space. I boarded a 6 person ‘flying bathtub’ of a Cessna to get images from above. Once airborne my eyes struggle to compute the information. The Namib desert is larger than many countries. So much space. So beautiful. Sand dunes snake their way to infinity. Again, shooting a photo is like fitting the universe in a shoebox. No photo can convey the feeling of being in the desert heat, wind and dust with a 360 degree view of pure desert. But I can try. And come back and try again and again, as I have fallen in love with this hauntingly beautiful place. My entire belief system is all natural science. But the normal laws of nature and physics do not seem to apply here. On every desert trip we’ve been discussing how far away the perceived horizon is. Meaning with a perfectly flat surface, where would an 1.8 meter tall human perceive the horizon to be with the curvature of the earth in mind? In the desert it seems like hundreds of kilometres. A lot of googling has not revealed a definitive answer but it appears to be around 4.5 kilometres away. The perceived horizon on a flat surface that is. Does not make sense. Here in the Namib it is 50 km at least. Also, my 17mm wide angle captures about a 110 degree view. In the Namib that looks like the width of a hair. 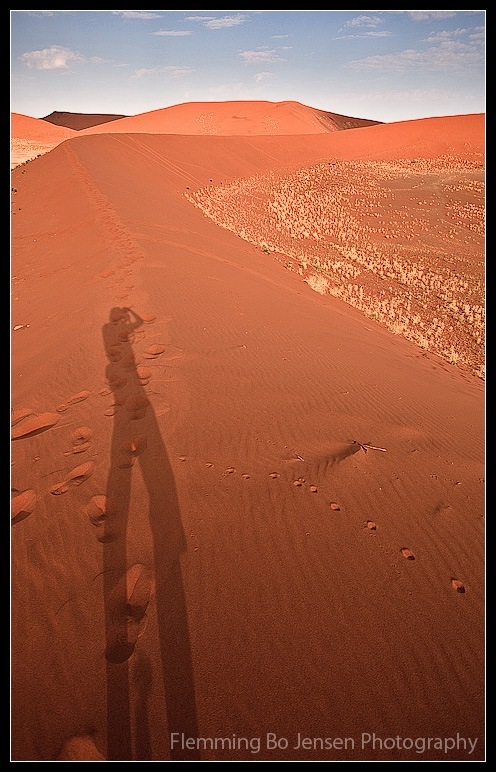 It appears the view in the Namib is also wider than 360 degrees. Driving back through the desert Sunday night we had bright as daylight deep red burning dusk light on the horizon in front of us. To the right a sliver of a moon. To the left the Southern Cross and a million stars. Behind us the dark night. Must have been a 720 degree horizon. Something magical is up with the laws of physics in the Namib! Creating images of this is indeed proving difficult but here’s a few quick previews of my feeble attempts of capturing the many shapes of the desert. I am saving the real hero shots for when I get home so stay tuned. Had to buy a sweater the other day! Desert gets warm at day but cools down quickly and gets cold at night! Also Swakopmund on the coast is sometimes haunted by a cold sea mist that I’m no fan of. So in the desert, you need a horse with no name, lots of sunscreen and also a sweater! Swakopmund was established by the Germans back when Namibia was a German colony, before World War I. So there are many German settlers here, and you can shop at SuperSpar and buy Ritter Sport and Nutella! Some of the German tourists here also seem to have a ‘How to look like a tourist’ competition wearing Khaki safari gear top to bottom. The German spoken is a ‘high’ German very easy to understand and I’m startled to find I remember my German and can follow almost all conversations. Afrikaans, still working on that! Driving at night here can be an interesting experience. Some of the back roads are not marked at all, so at night with an oncoming car it’s anyone’s guess where the road is. There are a few very interesting seconds where the cars pass each other, both drivers regain vision and discover they didn’t hit each other – and still have at least two out of four wheels on the car on the actual road! With every oncoming car this experience is repeated. Keeps you awake! The Namibian desert and sun is energy for my soul! I take it in like a solar panel, feel very re-energised, re-booted, re-vitalised! At Windhoek airport you step out of the plane straight onto the runway. Dry warm desert air caress my body, strong harsh sun light re-energises my soul. I immediately fall in love and I do a movie-like 360 degree spin looking at the sky and taking it all in. An American woman laughs and says “You must be happy to be home!” “Well, feels like home” I tell her! Customs only take two minutes, I pick up my bag and meet my good friend Gudrun and her cousin Kyra. We drive to Kyra’s house and I meet the rest of the family, the husband Etienne and kids Andre and Maxine. Their hospitality and friendliness knows no end. I switch to shorts, shirts and thongs. I sit in the garden literally inhaling the lovely weather and sunshine. Certainly feels like home! Cricket games in the garden, great barbecue (called braai in Afrikaans) for dinner, mozzie bites after 10 minutes. Certainly feels like home! My friend’s family and a pair of their friends are attending a wedding held in the bush – bush is called veld here and pronounced ‘felt’. Since it is the Easter holiday they are making a bush camping trip out of it. So off we go on Good Friday, to the farm where the wedding is held which is in the bush about 30 k’s out of Windhoek! The setting for the wedding is gorgeous and the bush camp is lots of fun as I struggle to keep up with a thousand campfire jokes told in Afrikaans. More to come about Swakopmund and the surrounding area. The world’s largest sand dunes in the world’s oldest desert are on the menu from Tuesday! See ya! I am shamelessly lifting the title from Jon Krakauer’s brilliant book and Sean Penn’s equally brilliant movie about Christopher McCandless. The title is just so fitting for my quest to photograph the world’s untouched, remote and desolate landscapes and for my “back to nature” obsession. Tuesday I take off Into The Wild. Namibia is the first stop in the next 3 months of travel and photography work that will also take me to Australia and ultimately Borneo. On Borneo in June I am working for 2-3 weeks for United Plantations; shooting their plantations and surrounding jungle on Borneo, documenting their eco sustainable production of palm oil. A very interesting assignment; I will be working alongside a Danish reporter with film crew shooting a documentary, while I take care of the landscape stills. Adventure and magical landscapes calls me. See you on the flipside!